When a book is reviewed in professional journals by an all-white staff of reviewers who praise the book and give it a star, and when the same book is then reviewed online by indigenous people and people of color who cite problems with authenticity and accuracy, and who point to tired tropes and stereotyping, I have come to trust the latter. Not because of skills I learned in library school 35 years ago, but because of years of professional development and life experiences I have had since then. I was at a library conference last week where I heard Sarah Park Dahlen give a powerful closing keynote about children's books and diversity. In it, she quoted Laura Jiménez, speaking about critiques of children's books by indigenous people and people of color: "Just BELIEVE US!" KT, thanks for your comment. I'm especially struck by the reminder in your last paragraph. I see Laura saying this a lot on social media; it's a shame she has to remind White people of this so often. Yikes. I just looked on the shelf of the juvenile collection I recently took charge of, and there's Ghosts. And it circulates like crazy. I'm fortunate that my predecessor didn't buy a ton of those sorts of things, but there are a handful that make me want to tear my hair out. I'm in a little bitty library where I basically *am* the children's department (and I haven't been to library school), and it's mostly fantastic to have so much autonomy, but what to do with a new-ish, very popular, but deeply problematic item is one of those situations where I definitely find myself wishing for a bossier boss, or a professor, or some kind of algorithm. Erika, like I hinted in the post, I work for a HUGE library system where I have very little say on purchasing. The one thing I can do, though, is hand-sell the heck out of other possibilities. "Oh, I see you like Raina T.'s books - have you tried NEW KID by Jerry Craft, it is SUPER funny and reminds me so much of SMILE and SISTERS!" And one other thing I do - if I see someone walking around with GHOSTS, I will actually let the adult know about the problematic content: "Excuse me, I noticed you have GHOSTS - I love SMILE and SISTERS, but did you know..." and then I'll give a BRIEF description of the problematic elements. I had to practice in a mirror and sometimes I still have a hard time finding the guts to say something, but if I was a parent and my kid had a book in their hand with some less-than-stellar representation I would definitely want the librarian to say something to me! p.s. - You may want to run that by your supervisor first, I'd hate to have you get hung out to dry in a situation like that... I've been lucky enough to have managers who will back me up if a patron complains, but I know not everyone is down with that kind of reader's advisory. Good luck, Erika! Those are really helpful ideas, thank you! I'm also very fortunate in the supervisor department, so it'll just be a matter of my own gumption to put those into practice. I’ve learned a lot from Pat Scales over the years about protecting the right to read. As a former middle school librarian like Pat, her groundbreaking Communicate through Literature program promoted by Judy Blume inspired me to use contemporary books to help young adults discuss issues of concern to them, even when the titles were controversial. (I was fortunate when one parent of a progressive tilt and I amicably parted ways over a book. Having a hard time discerning the author’s intent from one of the characters regarding race and gender, the parent removed her student from the group for the duration of the discussion but did not try to keep others from reading it. Her student returned to the group without further incident after we finished the book). When I later had four challenges in my first four weeks as a public youth services librarian in a community that tilted conservative, I again found guidance and solace in Pat Scale’s writings and work through the American Library Association’s Office of Intellectual Freedom. (While one title with a witch protagonist got moved from the picture book to the fiction section by my library director, the rest – despite expressed concerns about the occult, “foul” language and “a dysfunctional family” (i.e., homosexuality] – stayed put). When I returned to a school setting where we had challenges that I never would have anticipated (yes, sharks do tear up and devour their prey), I worked closely with my colleagues to develop a collection development policy based, in part, on the intellectual freedom principles I learned from Pat Scales. (As a result, we never had to remove a book or any other material from library circulation due to a challenge). Pat Scales has worked with and rightly been honored by the Freedom to Read Foundation and the National Coalition Against Censorship. I’m sticking with her. I not only want young people to have the freedom to read. I want to be able to stop by my local public library knowing that I can always check out whatever book I want without judgment. Thank you, Julie, for attesting to Pat Scales' truly unique, lasting, and important contributions to our profession, and to the freedom to read. I stand by her achievements too, but was as disappointed as Sam was in her take in this column. The word "censorship" is being used these days to shut down conversations that are not censoring, and I wish Scales' had done a better job in this column of grappling with that. We must be open to unique expertise that challenges the status quo. 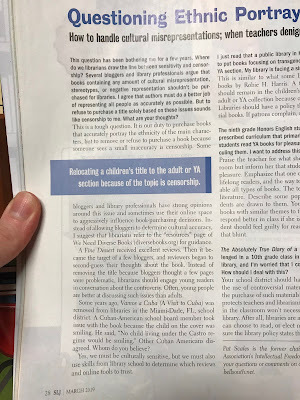 I, as you, "want to be able to stop by my local public library knowing that I can always check out whatever book I want without judgment.." but I know that doesn't extend to all we serve, because there is still firmly entrenched bias in our publishing, reviewing, and--yes--selection practices. When children from BIPOC communities feel mocked or erased when they browse for books in their public library, how can we say we’re allowing them to check out what they want “without judgement?” This is the disconnect that I’ve always struggled with in my career from the start, serving kids in Oakland CA. And as firmly as I depend on the groundwork Scales has laid in Intellectual Freedom, I depend on voices that our industry has consistently and persistently marginalized, in order to do my work well. I stand by them too.